I think the title of this post really reveals what is to come. I am so weary of people that are “Christians” using bad Christians or bad Christian experiences as an excuse to explain why they themselves no longer pursue God. I have seen it happen over and over again throughout my Christian walk. A person becomes a Christian, starts reading the word, praying, even finding a local church where they can attend, grow and serve, and then they come across what we will call a “bad” Christian or experience that causes them to stumble. It may be a person or group of people who wrongs them in some way. Instead of forgiving them, bitterness ensues. It may be a pastor or other lay minister’s morale failure that causes them to stumble. It may even be the general lukewarmness of the church today. No matter what the cause, it still does not justify one to abandon the pursuit of a God that never changes. Any industry, social group or even geographical region of people have their good and their bad. We have all heard the stories of the auto mechanic that rips you off but are they all bad? What about contractors who put out shoddy workmanship? They are not all that way are they? Do you stop eating out because you had a bad experience at a restaurant? I could go on. Even though we encounter “bad people” or “bad experiences” in many circles of life, it does not stop us from living. Neither should it stop us from pursuing the holy and loving God who at one time called us out of darkness — delivered us from the path of destruction we were on and from a hopeless future, and gave us life — His life. He did not change, did He? Maybe your perception of Him changed because of the folly of a few others but Jesus Christ is the same yesterday, today and forever (Hebrews 13:8)! People will fail. Companies will rise and fall. Even this great nation of the United States that I am so blessed to live in will fail me and ultimately one day will fall. God however is constant. He never changes and he never fails. And even though it may not seem like it at times, God always has a remnant. In other words, God always has a people, although not perfect, are striving to be Christ-like and pursuing Him with all their hearts. So, if you are excusing yourself from church attendance and even pursuing the things of God themselves, you really have no excuse. No one will stand before God on judgment day and justify their abandonment of God by pointing fingers at others. It is sad to think that so many that started off so well in their walk with God will fall short at the end of their lives, all because they allowed some one or some thing to offend them. 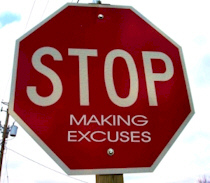 The real issue here is that our sinful nature is always looking for excuses that will justify our sinful actions. It started with Adam and Eve in the garden when after committing the first sin, Adam blamed it on the “woman whom You gave me,” and Eve blamed it on the serpent. So, Christians who have backslid away from God are really doing so because they want to. Using the argument like “all Christians are hypocrites,” “pastors only care about money,” or any number of other things is only a facade for what really is a heart issue. The Bible instructs us to look at Jesus, who is the author and perfecter of our faith (Hebrews 12:2) who always has a people that are devoted to Him. People will change but God never changes. People will fail you but God will never fail you. So stop excusing your unwillingness or even laziness to live for God on people, circumstances and things and pursue Him who will always love you and wants to bless you with the most abundant live you could ever imagine.